Why GandSwoodfloors for your project? Hardwood flooring, Why GandSwoodfloors for your project? Why work with average, when you can work with a premier hardwood flooring company? Avoid opting for sub-par products, poor workmanship, the lack of industry knowledge and training for the sake of something new. With G& S Floors, you will experience optimum personal service, with superlative, effective premium quality workmanship in the industry and high quality products. Homes are one of the biggest and most important investments and should be cared by an ideal company. Invest in "Quality" for peace of mind, better service and wood flooring that can last a lifetime or centuries! We've been in business over 19 years. We are a member of the National wood flooring Association, NWFA flooring contractor and follow industry standards and best practice for wood flooring installation, sand and finishing. We have access to training and ongoing professional development. We have a well trained staff and we never stop learning. We have a powerful network of talented professionals, distributors, manufactures and experts. We have knowledge of the newest trends and techniques. We use FSC certified sustainable, eco-friendly wood flooring products to ensure responsible forest harvesting to protect the environment. We use low VOC finishes and follow the United states Environmental Protection Agency (EPA) and Occupational Safety and Health Administration (OSHA) regulations to ensure a positive impact on health, protect the health of our employees, minimize the risk of accidents and reduce our impact on the environment. At every step of the way we take full responsibility of the the day-to-day workmanship and oversee everything from floor removal, installation to sand and finishing. We care about the detail and go above and beyond, down to the finest of finishing touches. You will see in the end results that really show. Your home will be the envy of the neighborhood! 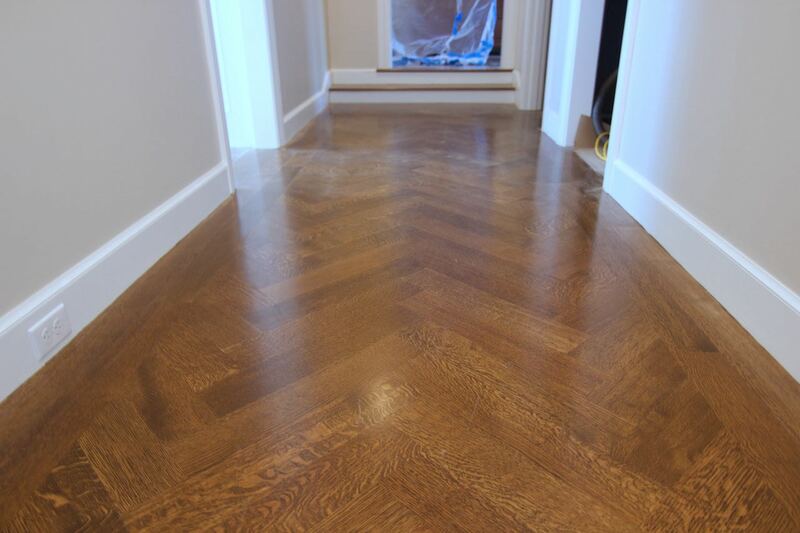 Herringbone pattern floor installed in a gallery style hallway. G & S Floor Service. warranty the workmanship of your Hardwood Floor installation and or re/finishing for one year after the completion of work. All workmanship is guaranteed to be first quality. Should there be any defects due to faulty workmanship become apparent, G & S Floor Service will correct the problem free of charge. Product defects are covered by the manufacturer’s warranty.